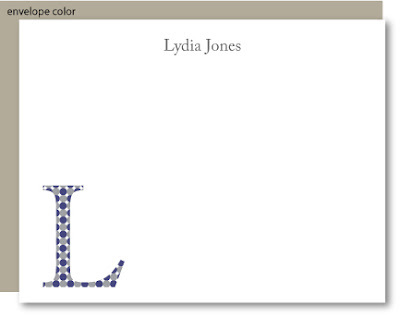 Again, per my love of client requests, I just included a new color combination for the popular dot monogram collection, following an inquiry about making available navy and gray to match a mom's nursery scheme. This color combo also would be good for "man stationery" (which my husband suggested I design more of). The dot monograms are one of my most popular designs, particularly for use on stationery and calling cards. And of course it could be applied to invites or announcements as well.